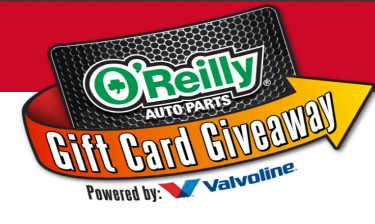 O’Reilly Auto Parts Gift Card Giveaway & IWG – Win a $100 O’Reilly gift card! Win a $100 O’Reilly Auto Parts electronic gift card (28 winners)! ENTER SWEEPSTAKES HERE – O’Reilly Auto Parts Sweepstakes page. You may request a free code (just click the link under the entry form). ENTRY LIMIT – Limit: Each entrant may enter two (2) Codes per day to receive a total of two (2) Sweepstakes entries into the applicable Daily Entry Period drawing and two (2) Instant Win Game plays per day during the Promotion Period regardless of method or combination of method of entry. ELIGIBILITY – Gift Card Giveaway is open only to legal residents of the fifty (50) United States (including District of Columbia) who are at least eighteen (18) years old at the time of entry. SWEEPSTAKES ENTRY PERIOD – The Promotion begins on December 28, 2016 at 12:00 a.m. Pacific Time (“PT”), ends on January 24, 2017 at 11:59 p.m. PT and consists of twenty-eight (28) daily entry periods (each a “Daily Entry Period”). Each Daily Entry Period begins at 12:00 a.m. PT and ends at 11:59 p.m. PT. PRIZES – Sweepstakes Prizes: TWENTY-EIGHT (28) GRAND PRIZES (one (1) awarded per Daily Entry Period): A $100 O’Reilly Auto Parts electronic gift card Terms and conditions of gift codes apply. Approximate Retail Value (“ARV”): $100. Auto Parts electronic gift card. Terms and conditions of gift codes apply. ARV: $10. 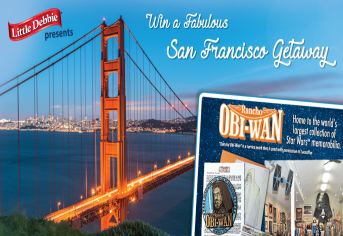 Little Debbie Rancho Obi-Wan Giveaway – Win a trip to California & more! Win a trip to California & more! ENTRY LIMIT – There is a limit of one (1) entry per person per twenty-four (24) hours during the Giveaway Period. SWEEPSTAKES ENTRY PERIOD – The Giveaway begins on Thursday, December 1, 2016, at 12:30 PM Eastern Time (“ET”) (the “Giveaway Start Date”) and ends on Thursday, May 31, 2017, at 12:30 PM ET. PRIZES – Grand Prize: The Grand Prize Winner will win a private tour for four (4) people of the Rancho Obi-Wan museum with lunch included. The Grand Prize includes coach round-trip air transportation for four (4) from an airport reasonably close to the Grand Prize Winner’s city of residence to San Francisco or Oakland, California; four (4) nights in a standard room, double occupancy, at the Fairmont San Francisco Hotel, with four (4) buffet breakfasts (value of $35 per person) at a designated restaurant in the hotel included; private car transfer for four (4) from San Francisco to the Rancho Obi-Wan museum; and your choice of a San Francisco day excursion for four (4) to be determined at time of booking based on availability. Airport and airline baggage fees for one (1), non-overweight checked bag per person are included. All travel arrangements will be made by a designated Sponsor representative whose decisions regarding the itinerary are final. Selection of airline and airport shall be at the discretion of Sponsor or its designee. Grand Prize Winner and his or her travel companions must have valid travel documents prior to departure, and failure to do so may result in forfeiture of the Grand Prize. The Grand Prize Winner is solely responsible for satisfying all legally required conditions of travel. Sponsor is not liable for any expenses incurred as a consequence of flight cancellation or delay or any weather or airline issues that prevent the Grand Prize Winner and/or his or her travel companions from traveling, in which event any missed portion of the Grand Prize trip is forfeited in its entirety and no substitution will be provided. All other expenses not specified above, including, but not limited to, additional meals, beverages, hotel activities, minibar fees, gratuities, incidentals, service charges, surcharges, rental car and travel insurance, change-of-ticket fees, unspecified taxes, and other transportation are the sole responsibility of the Grand Prize Winner. Travel must be booked a minimum of sixty (60) days in advance of travel departure date and must be completed by June 30, 2018. Dates are subject to availability. Blackout dates may apply. The Grand Prize Winner is encouraged to book early. The Grand Prize is valued at approximately $6,080. 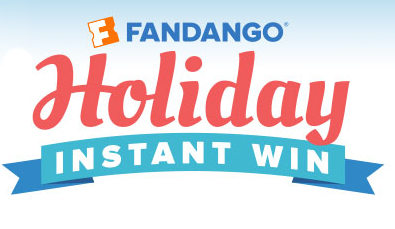 Fandango Holiday Instant Win Game – Win a $100 Fandango gift card! Win a $100 Fandango gift card or other great prizes! ENTRY LIMIT – Regardless of the method of entry, an entrant will receive no more than ten (10) Game Plays during the entire Promotion Period. SWEEPSTAKES ENTRY PERIOD – The Promotion begins on December 1, 2016 at 1:00 PM Eastern Time (“ET”) and ends on December 31, 2016, at 1:00 PM ET. 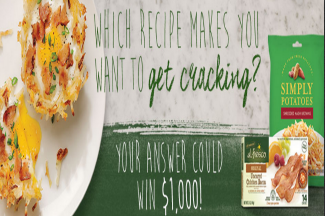 Vote for Your Favorite al fresco & Simply Potatoes Recipe Sweepstakes – Win $1,000 & more! 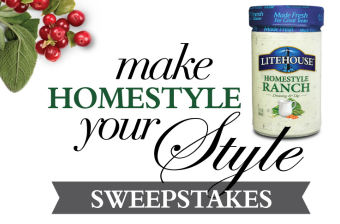 ENTER SWEEPSTAKES HERE – Al Fresco Sweepstakes page. ENTRY LIMIT – Limit: One online entry per email address per 24 hour period. Sweepstakes” (the “Promotion or Sweepstakes”), an Entry Sweepstakes, is open to legal residents of the 50 United States and the District of Columbia (U.S.), age 21 or older at the time of entry. AM, Eastern Time (“ET”) Monday, November 14, 2016 and 11:59 PM Eastern Time (“ET”) Tuesday, January 31, 2017. PRIZES – GRAND PRIZE: One (1) Grand Prize winner will receive one (1) check in the amount of $1,000.00, one (1) year’s worth any al fresco® product, issued in the form of 16-FREE coupons, maximum value of $6.99, (total approx value $112) and one (1) year’s worth of Simply Potatoes product, issued in the form of 16-FREE coupons, maximum value of $4.00, (total approx value $64.00). TOTAL ARV: $1,176.00. 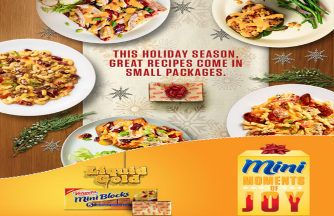 Kraft Mini Moments of Joy Sweepstakes & IWG – Win 4 gold bars! Win 4 1 oz. gold bars (worth $5,600)! ENTRY LIMIT – Limit one (1) Sweepstakes entry per day and one (1) Instant Win Game play per day during the Promotion Period per email address/person. SWEEPSTAKES ENTRY PERIOD – Promotion begins at 12:00 am ET on December 10, 2016 and ends at 11:59 pm ET on December 31, 2016. PRIZES – Sweepstakes Prize: One (1) Grand Prize: Four (4) 1oz. gold bars. ARV: $5,600. Instant Win Game Prizes: Three thousand (3,000) First Prizes: A mini block of Velveeta cheese. ARV: $6. ASUS “12 Days of Awesome” Sweepstakes – Win a custom-built PC! Win a custom-built desktop PC! ENTER SWEEPSTAKES HERE – ASUS Sweepstakes page. ENTRY LIMIT – Limit one registration per person. Earn bonus entries for completing various activities. ELIGIBILITY – To be eligible to participate in the ASUS ‘Hunt for the Perfect 10’ sweepstakes, an entrant must be a legal resident of the 50 United States (except Rhode Island), the District of Columbia, or Canada (except Quebec), and be 18 or older and the age of majority within the jurisdiction where the entrant resides at time of entry in the promotion (which may be 18, 19 or 21 depending upon the jurisdiction). SWEEPSTAKES ENTRY PERIOD – The promotion period will begin on 12/12/2016 at 10:30 AM Pacific Time (“PT”) and ends on 12/23/2016 at 11:59 PM PT. lastly, forty winners selected will receive a “Runner Up Prize” of one (1) randomly selected Game Code from the following games: DOOM, Deus Ex: Mankind Divided, Civilization VI, and Hitman, all with an approximate retail value (“ARV”) of sixty US dollars ($60). 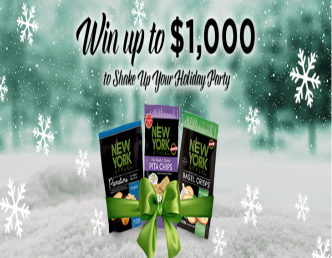 New York Style Holiday Shake Up Sweepstakes – Win a $1,000 gift card! ENTER SWEEPSTAKES HERE – New York Style Facebook page. ENTRY LIMIT – You can enter once during the promotion period. ELIGIBILITY – You must be at least eighteen (18) years of age at the time of entry and a legal United States resident (excluding residents of Puerto Rico). SWEEPSTAKES ENTRY PERIOD – Promotion begins on December 5, 2016 and ends on December 31, 2016. PRIZES – Grand: (1) $1000 Gift Card ARV. $1000 Second (1) $750 Gift Card ARV. $750. Third (1) $500 Gift Card ARV. $500. (15) Consolation prizes $50 Gift Card ARV. $50 each. Zebra Pen Sweepstakes – Win Zebra Pen products! Win Zebra Pen products (25 winners)! ENTER SWEEPSTAKES HERE – Zebra Pen Facebook page. ENTRY LIMIT – Only one entry per person per day. SWEEPSTAKES ENTRY PERIOD – The Sweepstakes for each day begins at 12:00:01 am Eastern Time (“ET”) on each calendar day in the month of December, starting December 1, 2016 and ends at 11:59:00 pm ET on each calendar day in the month of December until 11:59:00 pm ET on December 25, 2016. PRIZES – 25 Winners). 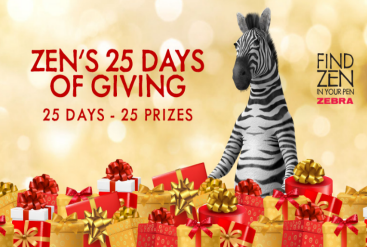 Each winner will receive a variety of Zebra Pen branded products with a maximum Approximate Retail Value of One Hundred Forty-Five dollars and Twenty cents ($145.20). 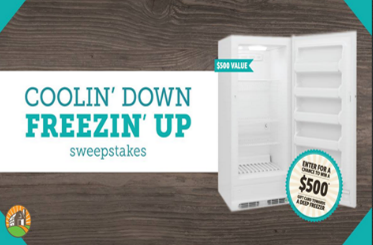 Zaycon Fresh Coolin’ Down Freezin’ Up Sweepstakes – Win a $500 gift card! ENTER SWEEPSTAKES HERE – Zaycon Sweepstakes page. ENTRY LIMIT – Limit one entry per person. Earn bonus entries by completing tasks. ELIGIBILITY – Participants in this Promotion must be legal residents of the United States, 21 years or older and accessing this site in the United States, its territories, possessions, or commonwealths. SWEEPSTAKES ENTRY PERIOD – The Promotion will begin on October 13, 2016 and run through 23:59 pm on December 14, 2016. PRIZES – One (1) Prize Winner will receive one (1) $500 gift card. All Prizes are valued in U.S. Dollars. All prizes to be awarded are not transferable and cannot be redeemed for cash. Any portion of the Prize not accepted by Winner will be forfeited. The Approximate Retail Value (ARV) of the Prize is a total of $500 (Five Hundred Dollars).